Happy Wednesday! I can officially say I'm ready for the weekend! Our oldest has a BIG birthday party this weekend and with everyone starting to get over the flu, I'd say it's a wonderful way to celebrate! The invites are done and delivered, now I just need to work on some tags for the goody bags and then we'll be finished. Chuck E. Cheese will handle the rest! On to what I had planned to share last week! I took some time out last week to rest and craft...a little...and made this cute little number! Lovin' these hippy flowers! 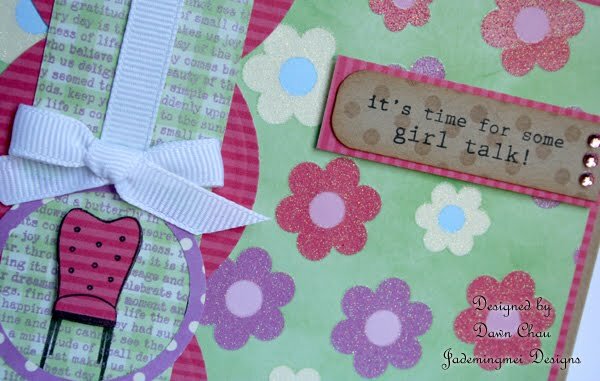 You have seen this paper on a recent "love bug" card I made. Although the photo doesn't pick up the detail, the flowers are very sparkly! Stamp set is Chair-ished. I took my green gingham strip and added some Text Style II in purple ink. I'm diggin' this funky piece of hippy babes! It's groovy! 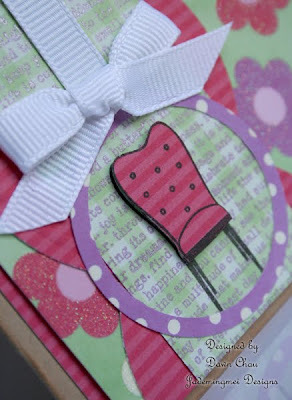 Super cute card chickie! Please wish my pal the Happiest of Birthday's. She's grown so much so fast. Wishes for a great day..